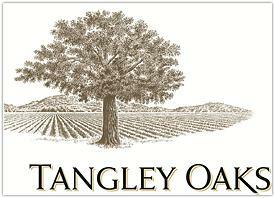 The wines of Tangley Oaks symbolize the majesty of California's native oak trees. Much like these grand trees, the grape varietals selected for Tangley Oaks wines represent the enduring legacy of California winemaking. With respect to this rich tradition, each appellation and grape varietal have been carefully selected to best represent the quality of Napa Valley, Sonoma Valley and the Central Coast. Just as these appellations have been carefully selected and cultivated by the great wine masters, it only follows that Tangley Oaks winemakers are as particular when selecting the lots for each bottle. These lot numbers are printed on the bottles of Tangley Oaks wines, and are a testament to the true expression of the grape varietal, the vintage and the appellation. In short, they indicate the wine is the very best of the vintage. During the winemaking process, Tangley Oaks winemakers follow all the time-honored methods until they reach a critical point. This is when the Tangley Oaks winemakers must select the lots -- representing the absolute best parcels from the vineyards that are worthy of bottling. Each member of the Tangley Oaks winemaking team tastes through each lot, carefully assessing the fruit, balance and tannins. This process is repeated for every varietal. Only when the winemaking team fully agrees on the one lot that best represents the varietal, appellation and vintage is the lot number chosen. This is the only way to select the best quality wines for the most discriminating palates. "Very well balanced on the palate, with full body. Bright flavors of blackcurrant, cherry and cassis, with a lingering finish. Lush texture, with velvety tannins and a long finish." This North Coast Caberenet is dark garnet with complex layers of black cherry, blackberry, cassis and mocha with a hint of dried herbs. It is structured and elegant, offering red fruit flavors, plush black currant, subtle spice and a hint of cocoa. "Tangley Oaks Merlot is a well balanced wine, offering lush red berry and plum flavors along with notes of espresso. Silky tannins and a lingering finish."